Mr. Bhim Gurung, like many farmers in Surkhet, has significantly increased his farm income by building on the training and agricultural support he received from the District Agriculture Development Office and USAID’s Knowledge-based Integrated Sustainable Agriculture and Nutrition (KISAN) project. However, his farm was still nonproductive during the six months of the dry season, due to a lack of irrigation. Both he and his neighbors were unaware of technologies that are available to pump water from a spring which flows 60 meters below their land. Through Winrock International’s Accelerated Commercialization Solar Photovoltaic Water Pumping (AC-PVWP) project and USAID’s KISAN project, Mr. Gurung learned about PVWP technology. He was very keen to pump water using the PVWP system to irrigate his land for year-round vegetable production, which would help increase his income. Mr. Gurung was able to convince 10 out of the 13 members of his Sitaram Agricultural Group to jointly install the PVWP system. The KISAN project had helped form the group and had provided training, agricultural inputs and technical support to increase both productivity and quality. 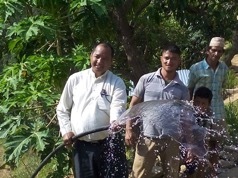 On May 2, 2015, with the support and collaboration of the AC-PVWP project, USAID KISAN project, and Veri-Ganga Municipality, Mr. Gurung together with his group installed a PVWP system near his farm. The high upfront cost of a PVWP system was a major challenge for these farmers. They decided to take a loan of Rs. 300,000 (USD 3,000) through a local agricultural cooperative — Small Farmer Saving and Credit Cooperatives. Winrock International provided a grant of Rs. 150,000 (USD 1,500) through the AC-PVWP project to enable the installation to be used as a demonstration site for other farmers in the district. Similarly, Veri Ganga municipality and the USAID KISAN Project also provided grants of Rs. 50,000 (USD 460) and Rs. 20,000 (USD184) respectively for the installation of the system. 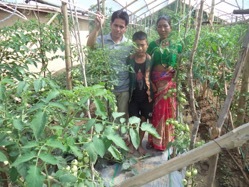 Along with his group, Mr. Bhim Gurung of Chinchu, Surket, purchased a $5,000 solar water pumping system in May 2015 to irrigate around three acres of land for vegetables like cauliflower, beans, tomato and green chilies. He and his group expect to recover their investment in two years. Within six months of installation, a significant change was seen in the village. Nonproductive land was converted to vegetable production and farmers were no longer dependent on monsoon rains for their crops. Villagers are growing off-season vegetables like cauliflower, tomatoes and chilies, which they are selling at nearby markets. Mr. Gurung reported that in a single growing season he had vegetables sales worth Rs. 150,000 (USD 1,500), and his neighbors have similar stories. The AC-PVWP project is working to increase awareness of the benefits of solar irrigation and to accelerate commercial sales of solar pumps to smallholder farmers in collaboration with the KISAN project, solar pump suppliers and agricultural cooperatives. With the AC-PVWP project’s involvement, solar pump suppliers have also introduced reliable and affordable pumping products with new financing models to increase the solar pumping market. Under a proposed financial arrangement, farmers will not have to worry about high investment cost; rather, they will be able pay in installments within a period of three years. In addition, farmers get free after-sales services for three years along with a replacement warranty. In December 2015, the AC-PVWP project organized orientation and field demonstration programs for smallholder farmers, cooperative representatives and officials of the District Agricultural Development Office (DADO) from Surkhet, Dailekh and Bardiya districts. The planning officers from DADO made a commitment to the integration of solar irrigation into their work plan. They also committed to providing the necessary technical and financial incentives to farmers for the construction of storage tanks for solar pumping.